Dr Di Donato studied medicine at the Medical University of Kharkiv, Ukraine. 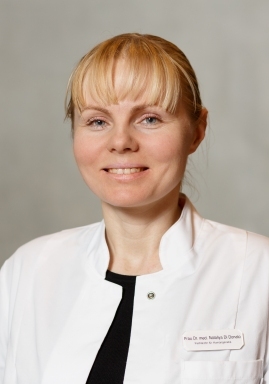 Her PhD thesis (undertaken in the lab of Dr Albert Schinzel in Zürich) was on the “Identification of candidate gene loci for congenital brain defects with the help of unbalanced chromosome aberrations”. Dr Di Donato has held research fellowships in Switzerland, Germany and the United States. From 2011 to 2014, Dr Donato was Head of the Genetic Counselling Department, Institute for Clinical Genetics, TU Dresden. Dr Di Donato is now Group Leader at the Institute for Clinical Genetics, TU Dresden. Her research group focuses on malformations of cortical development. Dr Di Donato is leader of Neuro-Mig Network Work Group 3 (WG3).